The ports in the rooms are barely defect. In most cases there is a problem with your cable or computer. If the checklist below shows that there can be a defect port we will send a technician. The technician will not look at your computer it is therefore really important to complete the checklist. If there is a plug socket with 2 ports try both of them. In most cases it is the left one. Ask a neighbor if you can test your computer at his port with his network cable. Are you online? If yes there could be a problem with your network cable or port. Continue with point 2. If not the problem lies most likely with your computer. Please check your Network configurations. Ask a neighbor to connect his computer with your cable in your room. Does it work? If yes your cable and port are working and the problem is probably your computer. If not Continue with point 3. Plug your neighbor’s cable into your port and connect first yours and then your neighbor’s computer to it. Does one of the computer have an internet connection? Are both online your network cable seems to be defect or the wrong cable type. Have a look at our article about Network cable . If only your neighbor`s computer has an internet connection both your network cable and port are working fine. Please check your network configuration . 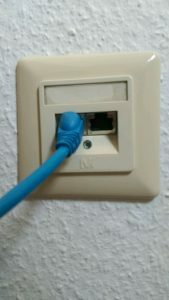 If both computer have no internet connection the port is probably defect. Please contact us. Connect your cable to your neighbors port and computer. Are you online? If yes the port in your room is probably defect. Please contact us. If not your network cable is defect or the wrong cable type. Please read our article about network cable.